Do you know what The Green Party position is on an EU referendum? The Green Party has a really good policy on whether or not we should have a referendum on the UK’s membership of the EU. In short it says ‘Three Yeses’: Yes to a referendum, yes to major EU reform, and yes to staying in a reformed Europe. This position is progressive, democratic and most importantly in line with a large chunk of public opinion. Of course, the problem is that nobody knows this. Try it out now, turn to whoever you’re nearest to and ask, ‘Do you know what the Green’s position on the EU is’? You can post photos of the blank faces in the comments section below. 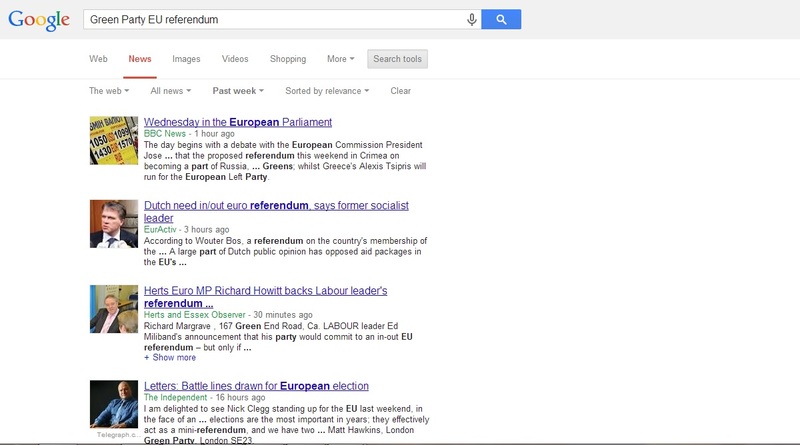 Well, below is a screenshot of Google News with a search set for the last week for the term ‘Green Party EU referendum’. Surprise surprise, not one relevant article appears (click on the image to enlarge). This at least partly explains why no one knows what The Green Party position is…it just doesn’t feature in the press. Now, normally at this point in a blog I would start blaming the editors of the mainstream papers for not showing an interest in Green Party policy, but in this case, that just doesn’t explain it. Over the last week, while Labour have ensured the issue of an EU referendum has been on every editors thoughts, The Green Party has stayed silent. No press release, no social media campaign, no slogans. I have watched on as my disproportionately Green twitter feed has ticked over without a single mention of The Green Party’s ‘3 yeses’ policy. While Labour are saying no to an EU referendum (unless the UK was being asked to transfer more powers to Brussels), The Green Party are offering a progressive, democratic and internationalist alternative. Something that is so clearly missing from the UKIP driven EU debate. I simply don’t understand why every Green is not shouting about this from the rooftops. With just over 2 months though until the European elections I am not sure how many more media opportunities The Green Party can afford to miss like this. They need just a 1.6% swing in the vote to triple their number of MEPs but to get that, people need to know what they stand for. 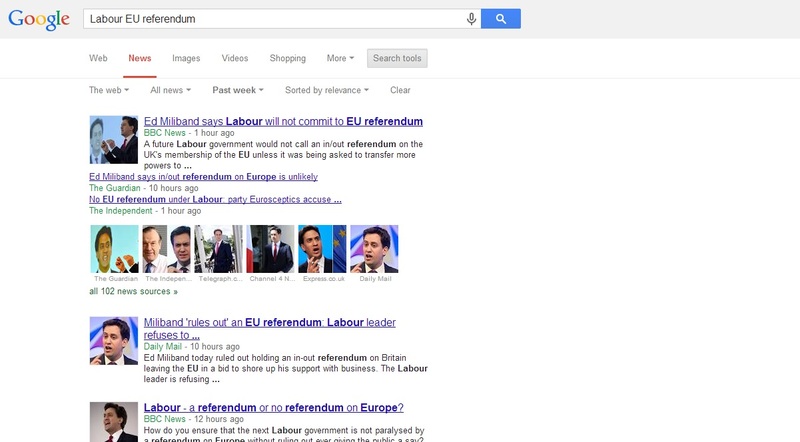 Read the BBC summary of what Miliband and Labour are offering here. Read The Green Party ‘3 yeses’ policy launch here. Read the full Green Party policy on the EU here. Keith Taylor MEP for South East England has just released this press release: Green MEP calls on pro-EU politicians to have the ‘guts’ to promise a referendum. Good on him! Let’s hope the press are listening! Hi Steve. Good post. It is actually a 1.3% swing that we need, which is how far Y+H were away last time.